Objects Of Affection: The Amazing ~ Mom Bot! Are you a mom robot...are you busy all day changing diapers, giving bottles, doing laundry, doing dishes and all of the other many various chores? This mom robot knows exactly how you feel, and her stress level shows it! 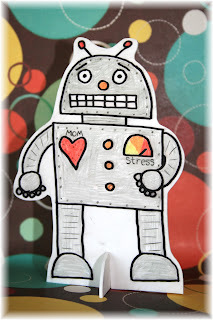 This fun little bot is made from shrinky plastic and hand colored by me! She measures about 4.5" X 3.25" wide.